Janelle In Real Life: My baby is the best baby. My baby is the best baby. 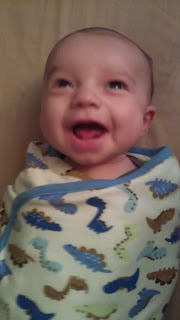 I know that I just blogged yesterday... but I just need to say MY BABY SLEPT 10 HOURS STRAIGHT LAST NIGHT. Carson has been such a good sleeper for us lately and it is awesome. The first month or so of his little life... it was sooooo hard. He only slept for 2 or 3 hours at a time during the night and sometimes he would even wake up in 1/2 hour or hour increments. I was functioning on 3 or 4 hours of sleep a night and I thought it was going to be the death of me. We'd tried swaddling him in a blanket because newborns are supposed to like the tight coziness and it can keep them from waking themselves up in the night from body twitching and things. 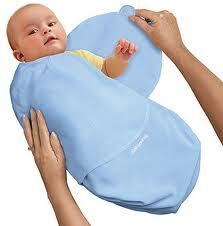 Unfortunately, Carson fought us hard on that and would scream and break out of the swaddle. Tough times I tell you. Those nights he wouldn't get a wink of sleep until 2 a.m. and then would continually wake up through the night. Steven and I had to do shifts with him to try and stay sane. ...and it was amazing. 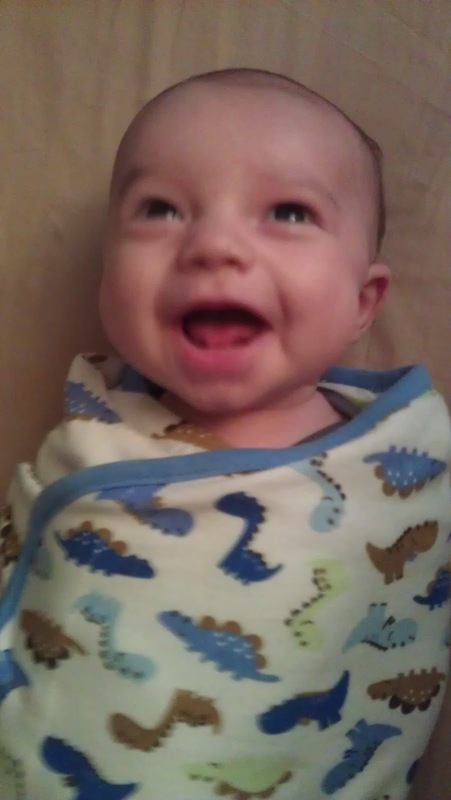 He slept for 6 straight hours and I woke up soooo excited. Ever since then we've used the "swaddleme" which has little velcro things that keep their little arms in (kind of like a straight jacket, but whatevs). He fought it still at first but, you know, it's for his own good. Now we have a little routine where we start getting him ready for bed around 9 p.m. by changing him, swaddling him, and then filling his little tummy full of milk. It used to take about 2 hours to get him down, but now it's down to 30 minutes to an hour. He sleeps for 9-10 hours at night and then takes a 2-3 hour nap during the day (most of the time) and at 2 1/2 months old, I feel like that is pretty exciting. And some of you are probably like "that is the most boring thing I've ever heard." But I am excited and that is all that matters. "kind of like a straight jacket, but whatevs." killing me right now. Also, that child is so adorable.